Slate Rock Safety, LLC (“Slate Rock” or the “Company”) is a leading specialty distributor, ecommerce retailer, and corporate clothing solutions provider of work and safety work apparel, particularly specializing in flame resistant safety clothing. MelCap Partners, LLC (“MelCap”) successfully represented Slate Rock in this sale transaction. As the Company’s exclusive investment-bankers through this process, MelCap Partners assisted Slate Rock in selling the business to the most logical strategic buyer for the business. 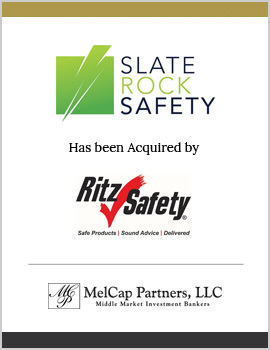 In an effort to continue to support the Company’s strategic growth plans, and to provide its customers with continued high-quality products, Slate Rock was sold to Ritz Safety, a strategic buyer located in Dayton, Ohio.